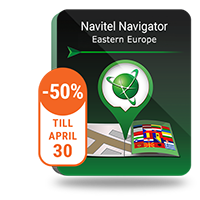 Updated Q1 2018 maps of Brazil, Colombia, Mexico, Peru, the Maldives, and the Philippines are now available to the users of Navitel Navigator. The maps of this release contain 2 296 065 km of the road graph, 448 398 POI, 316 773 cities and settlements, of which 8 052 include road networks and address search (in the Maldives — down to individual bungalows). The map of Brazil contains 5 564 cities and settlements, of which 3 581 include address search. The map contains 257 518 POI. Total length of the road graph is 1 210 957 km. The map of Mexico contains 257 134 cities and settlements, of which 1 962 include address search. The map contains 45 310 POI. Total length of the road graph is 684 330 km. The map of Peru contains 34 029 cities and settlements, of which 719 include address search. The map contains 53 046 POI. Total length of the road graph is 133 772 km. The map of the Maldives contains 745 islands. The capital, Malé, and the Addu Atoll feature a detailed street network 387 km in length. The POI database includes 1 557 POI. Its 45 islands include precise, down to individual bungalows, address search, including 58 hotels.